Work starts today to transform a car showroom on Harrogate’s Leeds Road into a new Marks and Spencer Simply Food store. The current occupants, Vertu PLC, are due to vacate the site by the end of July when work will begin to demolish the buildings. The project, which will transform the Leeds Road, Hookstone Road and Leadhall Lane junction, will begin its initial phase on Hookstone Road. 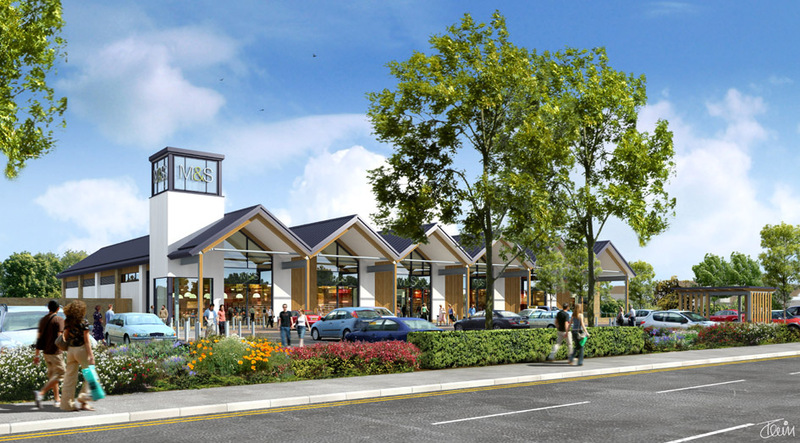 The project is being development managed by St James Securities on behalf of Hornbeam Park Developments Ltd and the contractors are GMI Construction Group PLC. “Undoubtedly there will be some traffic delays during this project but we will do our best to mitigate these as much as we can. “We delayed the start of works until after the Great Yorkshire Show and planned it close to the school summer holidays when traffic volumes reduce. Changes to the junction were among the conditions of planning consent and the developers will be working with North Yorkshire Highways department throughout the project. The new c32,000sq ft development will be accessed from Beech Avenue, with an exit on to Hookstone Road, and will have extensive parking. The junction improvements will see a widening of the carriageway to provide an extra lane for town centre-bound traffic, new traffic lights and resurfacing of the whole junction as well as improved crossing facilities for pedestrians. The demolition, construction and highways work is expected to take about a year, with the fitting out for the new store then beginning.